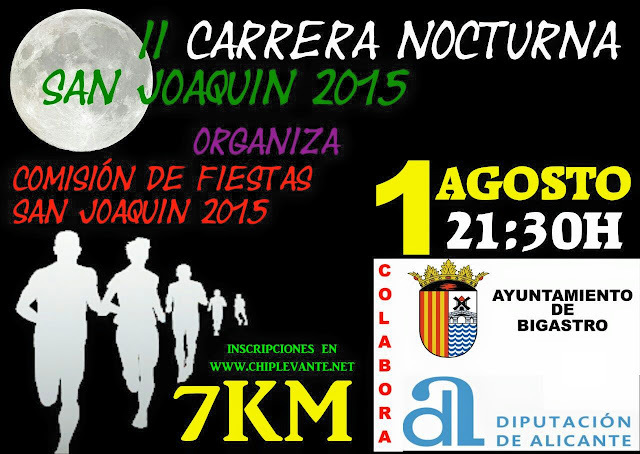 9:30pm – 7km run organised by the Fiesta Commission in collaboration with the Diputación de Alicante. At the end there will be music with a DJ. For more information and to subscribe go to Chip Levante. 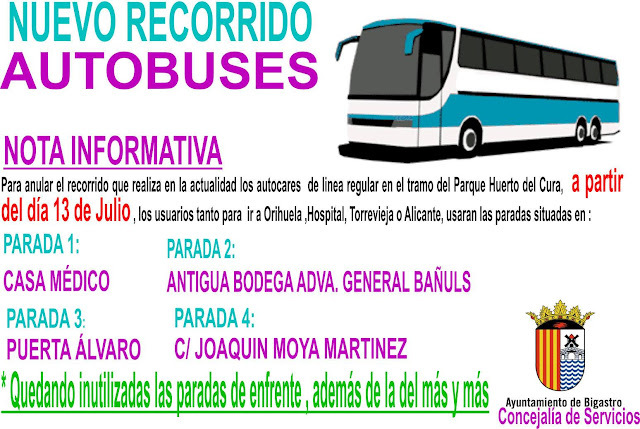 8pm – A football match between Orihuela and Bigastro veterans in honour of Joaquín Larrosa (El Chochón). 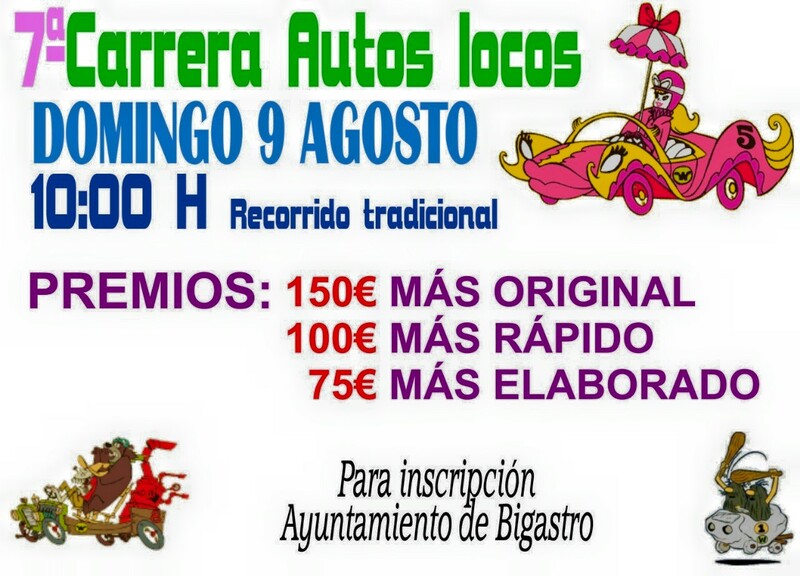 A chance to see players from the golden age of football for the Vega Baja. Venue – Polideportivo Municipal. Hopefully, the books for the fiesta will be distributed soon. More to come on our return! This is the route our plane is expected to take to Mallorca. You can't get more direct than that. Estimated flight time - 55 minutes. 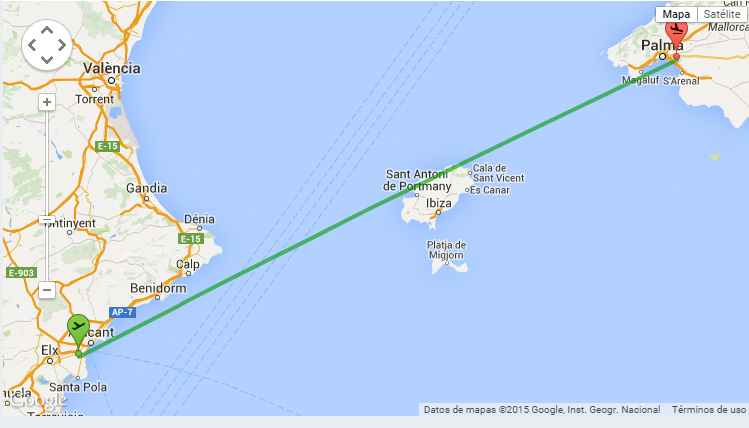 However, with a 45 minute drive to the airport, 2 hours in the airport, the time at Palma to collect our cases and then the car journey to the north of the island, the flight will be the shortest part of our journey. Whilst Pam and I are flying to Mallorca later today, the rest of the family are already on their way from Manchester. Their flight was subjected to a delay and so the Captain allowed the young passengers onto the flight deck. 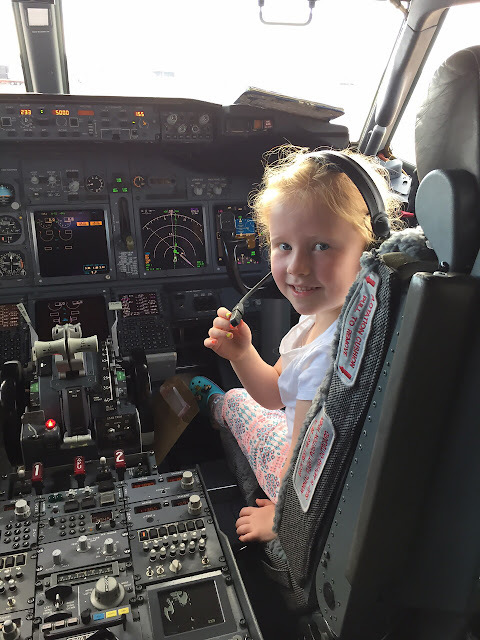 This is my granddaughter Molly, sitting in the seat of the First Officer. I might be biased but how beautiful and confident is she? Best known as a resort for inexpensive holidays, a resort for stag parties, cheap booze and lots of sunshine. However, there is another side to the town, more upmarket appealing to a different type of clientèle. In fact, until the 1960s it was a sleepy fishing village with a population of 3,000. Then Franco relaxed his opposition to mass tourism and more important the bikini. The locals built hotels to accommodate the new visitors and the rest is history. The mayor of the town is now convinced that Benidorm meets the criteria for becoming a World Heritage site and has made an application to UNESCO. He says that the process could take three years but is convinced that they will make it. He hopes that the status will help to transform the place and encourage more of the "classy" tourists. We are well used to the "young ladies" along the roadside offering their services to men and should not be surprised to hear that there are prostitutes on the streets of Benidorm as well. According to an article in The Costa Blanca News though, not all of the prostitutes in Benidorm are what they seem. Between midnight and the early hours of the morning, groups of young women stand on the streets of the so called British quarter. Their aim is to lure drunken British tourists with the aim of robbing them - money, phones etc. Apparently this is causing a major headache for the council. I wonder which is worse, the fact that they are thieves or that they are giving the oldest profession a bad name. We've just been down to the town to complete last minute preparations before going on holiday tomorrow. It was hot in the sun when we arrived and even hotter on our return. Stepping outside into the heat was like being hit by a hairdryer. The good news is that it should be cooler here tomorrow. The bad news is that Monday is forecast to be even hotter than today. Pam and I are heading for Mallorca where the temperatures are normally about 5 or 6 degrees cooler than here. 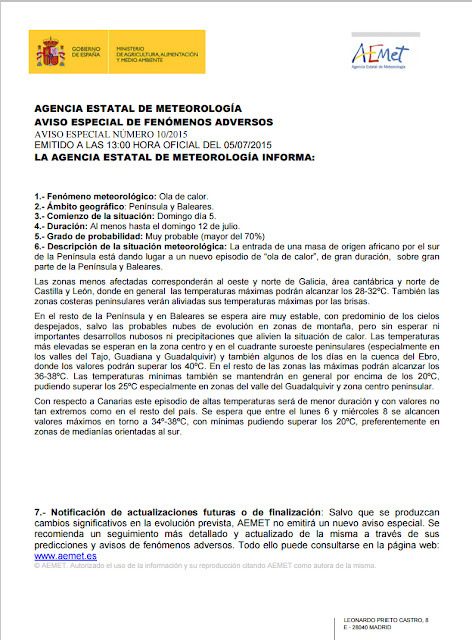 Many of the Spaniards we have spoken to are taking their holidays in Santiago de Compostela where the maximum today is a cool 22 degrees. I never thought that there would come a time when I wanted to escape the sun. In my late 30s and 40s I would lie out all day in it - not anymore. These days I prefer to be in the shade for much of the day. Just look at this impressive road. I'd fear to drive up that in a car let alone ride up on a bike but that is what the riders did yesterday in the Tour de France. 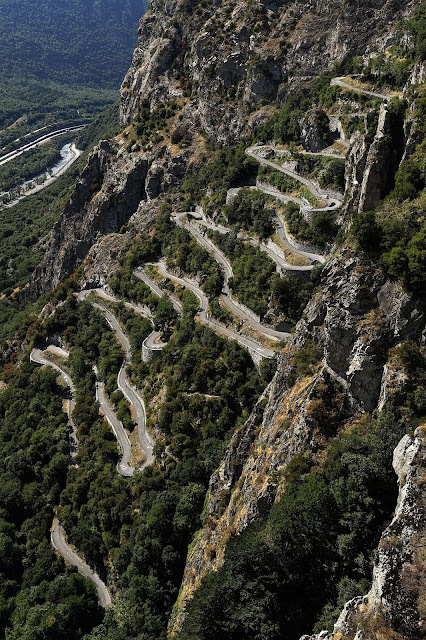 PS You have to admire the French for finding a way to build a road up an almost sheer rock face. Just to let you know that there will be road works in the town on the 24th and 27th of July that will necessitate closing some of the streets. The aerial views show the alternative routes to take whilst this work takes place. The one way system around the town is confusing at best, these temporary changes could cause a little chaos for some drivers. Tuesday I said we should try the food at Camping La Pedrera. My friends, Scout John and his wife Carol did just that and this is what they had to say about the menu del dia. It was good, five choices of starter and main, plus a huge plate of beautifully fresh salad, a bottle of wine between two, and dessert was two huge pieces of melon, we could not finish it all. Well worth 9 euros. Sounds tempting to me, We have some of the family coming over late August so we might just give that a try because a) it beats cooking and b) we can walk there allowing Pam and I the chance of a drink. 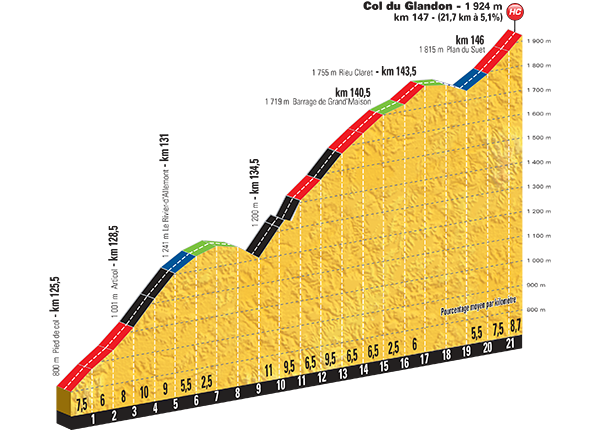 This is what the riders face in today's stage from Gap to Saint-Jean-de-Maurienne. Although the Col du Glandon is officially 21.7kms long, the riders will be climbing on and off for 47 kilometres with some brutal sections to cover. Watching Stage 17 yesterday, you could see that many of the riders were suffering so what condition they will be in after today we shall see. By Saturday and the ascent of Alp d'Huez they will all be looking forward to a leisurely ride into Paris. Could be a change in the weather for August according to this prediction. We will wait and see. In the meantime, there is a strong possibility of a thunderstorm this afternoon especially over the mountains to the back of us. Coming before the Fiesta for San Joaquin, is the one for Santa Ana held in the area of the town that bears her name. 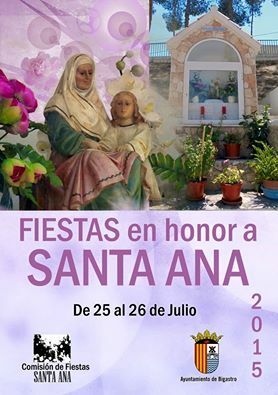 Santa Ana was of course the mother of Mary and wife to San Joaquin as such she was also the Grandmother of Jesus. One of the features of this particular fiesta is the presentation of the new infant court, junior court and third age king and queen. As those who have had the honour to be third age kings and queens will testify, this presentation usually takes place in the early hours of the morning. You could say it is good preparation for the long nights to come during the main fiesta! 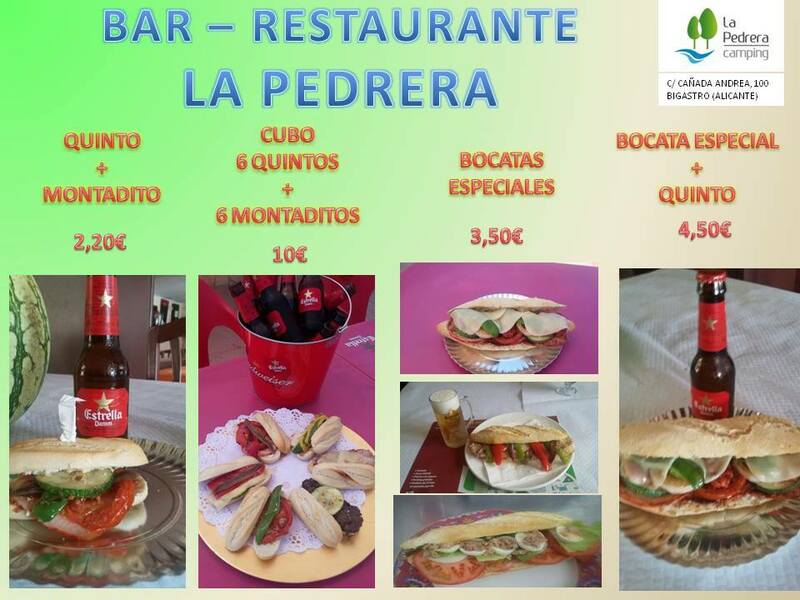 Right on our doorstep, Camping La Pedrera offers some very good food at very reasonable prices. Those who have tried it recommend the food. Recent pictures of the bar/restaurant show that the new owners have made it a lot brighter and more welcoming. Gone are the days when it looked like a sleezy nightclub. We constantly read about disaffected youth in the newspapers and how this may have driven some to join ISIS. Elsewhere the disaffection seems to lead them into acts of vandalism. We understand their frustration with society but what we cannot comprehend is their reaction. How does destroying their environment improve their situation? If anything, I would have thought it made it worse because they end up living surrounded by slums. One particular target in Orihuela is the Rincon Hernandiano. It is a major tourist attraction in the city visited my thousands each year. It needs to be kept in pristine condition but the Foundation Miguel Hernandez seem to be fighting a losing battle. In the last few months, the Museum house had paint daubed on the walls and a traffic signal was thrown onto the roof. Then there were several windows broken but for what reason? Are the perpetrators trying to make a point or is it just destruction for destruction's sake? The police really need to capture some of these individuals and question them about their motives. Do you have large household items that are no longer needed? These can be left by the bins for collection on Tuesday mornings. You are advised to put the items out between 9pm on Monday night and 8am on Tuesday morning to avoid inconvenience to your neighbours. What can you leave for collection? Household goods, furniture, chairs, mattresses and electrical appliances. 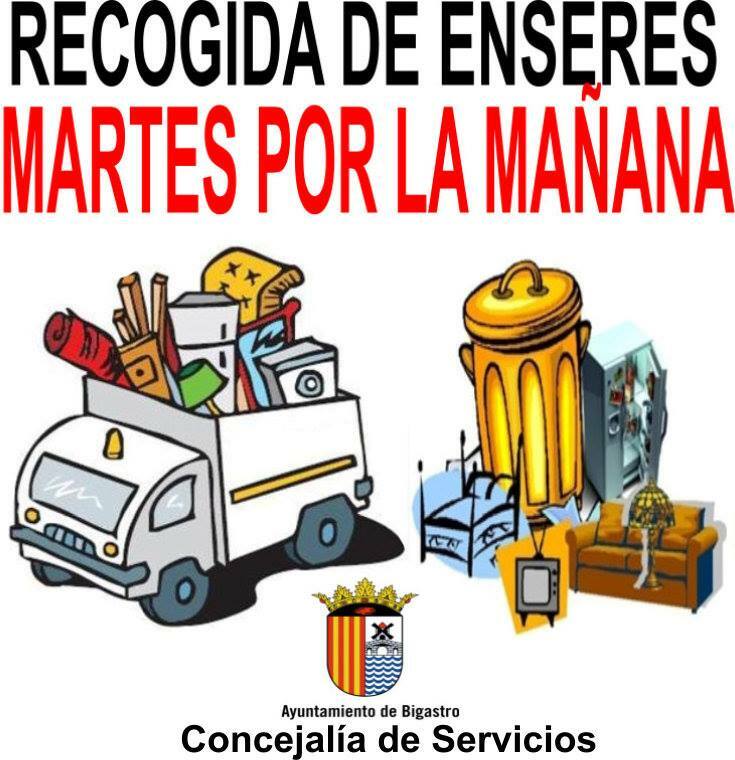 The service does not include debris or house clearances. You need to hire a skip for those sort of items. Preparing to take the lead in the Moors and Christian parades is a huge undertaking which needs plenty of time. In the early hours of Sunday morning the two groups that will lead next year's parades announced their Ambassadors. The Moros Beduinos were first to proclaim Juan de Dios Rogel as their champion. They were followed by the Caballeros del Rey Fernando who have chosen José Rubio as their leader. 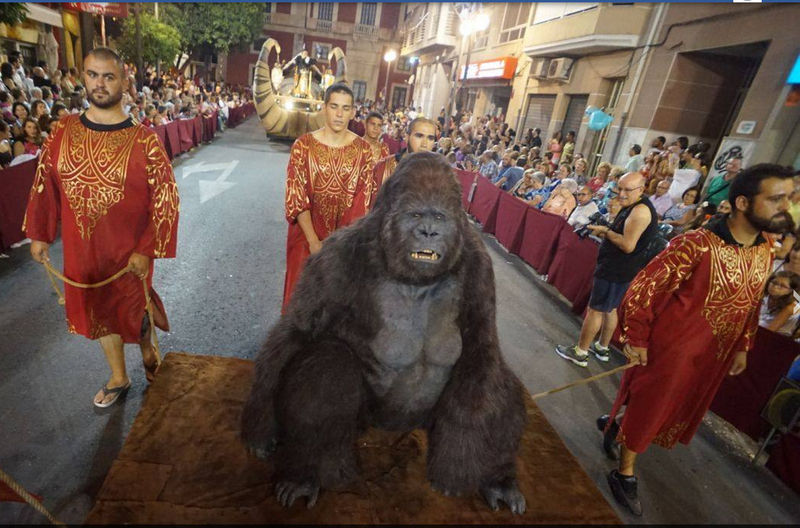 When this huge gorilla came down the street on Friday night, we could not decide whether it was a real animal or a man in a suit. Our neighbour Eladia, who was on the other side of the road, said it certainly looked real. When it stood up, the face moved and the mouth opened, I thought it must be real but would even Spaniards risk bringing a gorilla into the city? You can judge for yourselves from these two photos, The first one is mine, the second is from the newspaper Laverdad. I think we might just be too old to participate but we will be there to take photos. 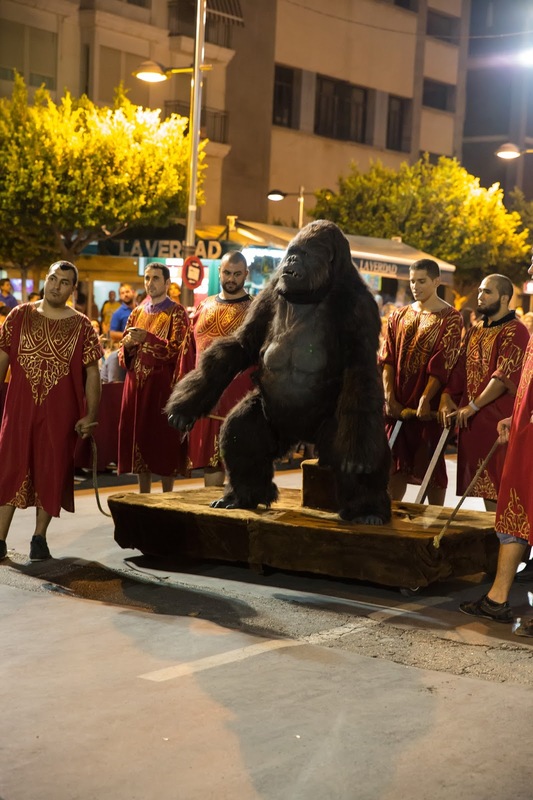 Last night was the turn of the Christians to parade the streets of Orihuela. Leading the parade were the Contrabandistas - OLE! There were dancers, horses, carriages, oxen, birds of prey and giant mechanical bird lead by a troupe of young ladies twirling flaming torches. Every year we see something different, it is a show not to be missed. The link to my photos is in the sidebar. It might have started late and kept us up until 2am but it was worth it. Last night it was the turn of the Moors to take centre stage in Orihuela. Leading the parade were the Moros Realistas but only after two dancing troupes and a massed band passed by in the Calle. Amongst the many lines of real moors in costume were more assorted dance troupes, camels, horses, a gorilla, a choir, lots of bands (including 80 musicians from Bigastro in costume), a giant Aladdin's lamp, a huge float with the Ambassador sat in the middle, acrobats on poles and a man riding a platform fastened on top of two camels. Later in the parade were the other Orihuela comparsas including the Black Egyptians in their elaborate and highly ornate costumes. You can find photos in the album linked to in the sidebar. 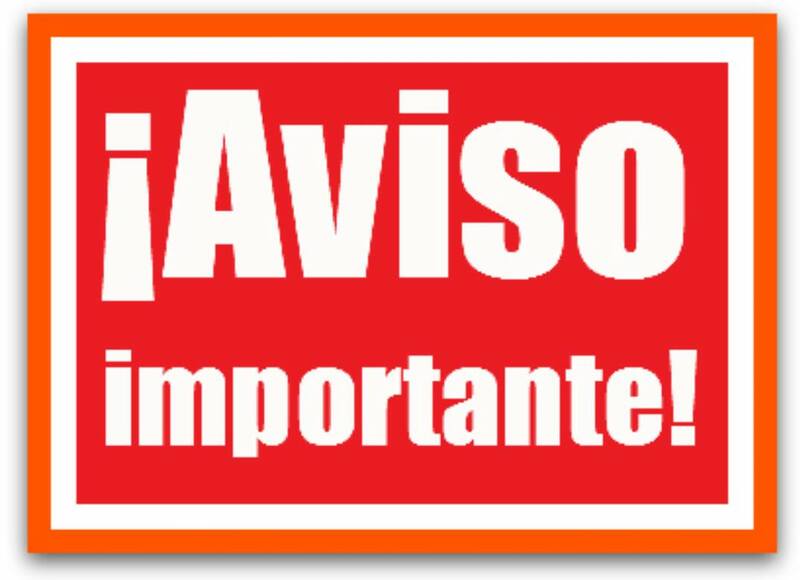 Those of you who go to Alicante-Elche Airport departures to drop off visitors need to be aware that there will be a new barrier system operating at departures. There has always been a limit on the time you could park there but it has been difficult to enforce. Only on a couple of occasions have we seen police taking car registration numbers to monitor the time that people stay. Clearly there have been many who have abused the system and parked there well over the limit. That has made it difficult for legitimate users to find a space particularly in the summer months and at peak times. Pam and I use a company called Plane Parking to look after my car whilst we are away. Unlike other parking services where you drop off your car at a depot and are then taken by minibus to the airport, Plane Parking pick up your car from departures. They then bring your car back to departures on your return. 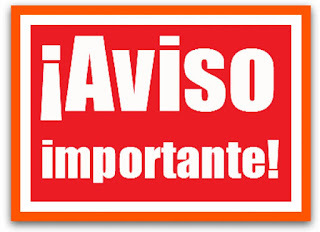 Because of the new barrier system, we are advised to arrive at the airport at the time we have booked and not before. This should give the Plane Parking people chance to book us in and take the car away within the time limit. On our return, we are asked to phone Plane Parking once we have cleared the baggage reclaim hall to let them know. Only then will they bring our car to departures for us to collect. Those who want to drop people off and wait with them would be better off parking in the multi-storey car park where they will pay less for their time than they would at departures. Whilst the workmen are busy pruning the trees in the municipal park, you are advised not to go in. Actually the gates are locked so you would have a problem if you even tried to enter. The PP have agreed to raise the property tax that we pay by 21% in return for a loan of 1.22827 million euros which will allow the council to pay off a bank loan taken out by the previous administration. The money, which is coming from the Ministry of Finance, will be paid back over 10 years - possibly 20. They say that this will save the town 720,000 euros in default interest and legal costs. The new mayor, Teresa Belmonte, says that they can use to money saved to pay for the planned scheme to hire and train young people that could not be implemented before due to lack of council funds. In relation to the rise in IBI, Belmonte says that, for a property with a value of 50,000 euros, the cost will be 34.50 euros. She says that this will be offset by a reduction in the cost of waste collection of 42 euros. Those who have properties valued in excess of 50,000 will of course lose out. I know that there are some residents here who like to watch the parades of Moors and Christians in Orihuela. Here are the dates and times for you. 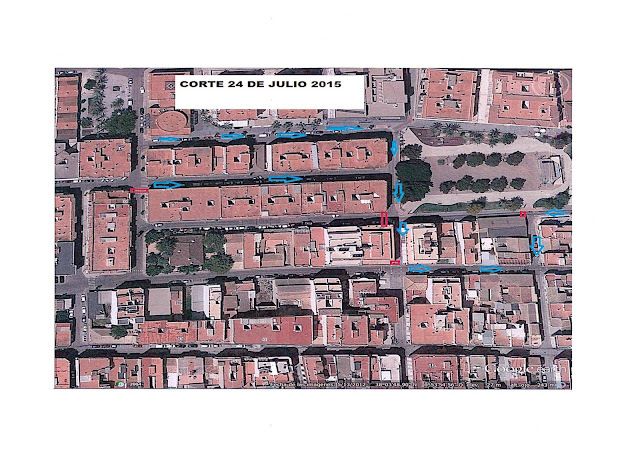 Friday 17th July at 9pm, the parade of Moors will take place. 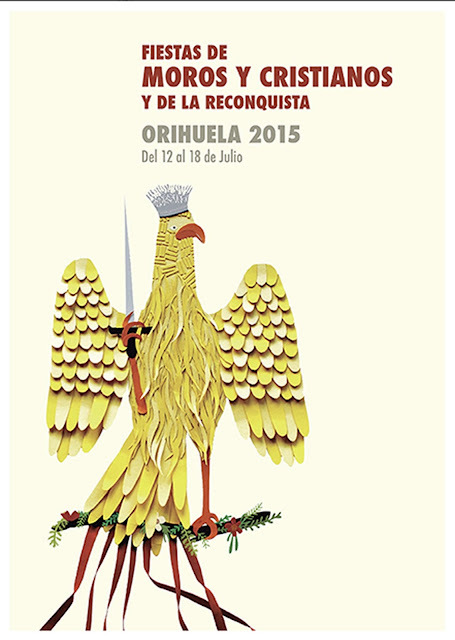 Saturday 18th July at 9:30pm, the parade of Christians will take place. Those of you who are a lot fitter than me might want to take part in this 7km run. NB Seven metres would be a better distance as far as I am concerned! This is the official notice from the Fiesta Commission about the Gastronomic Day. 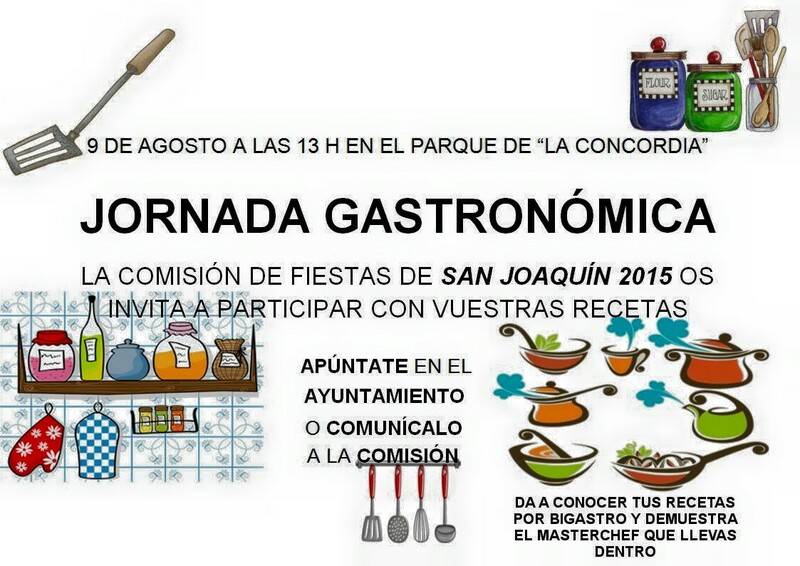 Please note that the venue is the Parque de la Concordia and NOT the Parque Municipal Huerta del Cura. Also note that the date is the 9th August at 1pm and NOT on the 11th at 12 noon as per the note circulated to residents at Villas Andrea. Those of you who are planning to participate might want to take up the invitation to pass on your recipes and demonstrate your Masterchef talents! 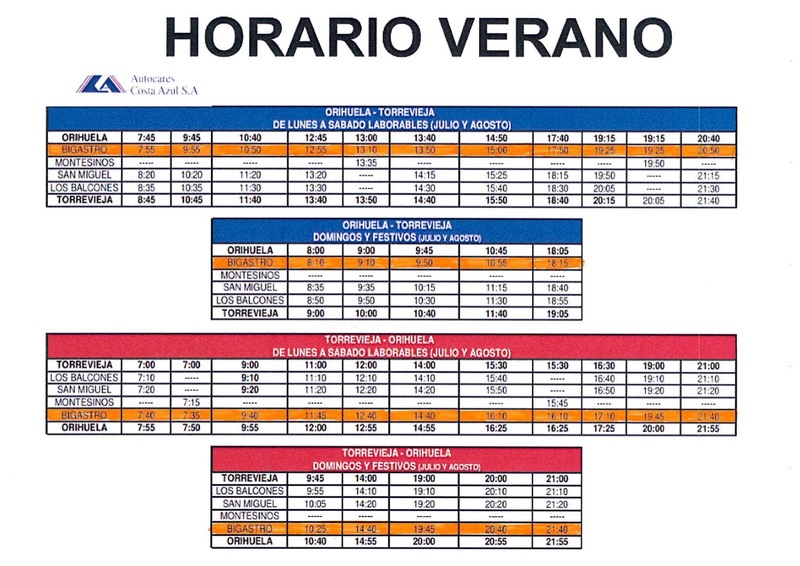 Since there are no timetables at the bus stops, this is useful information for those who want to use public transport. These are the prizes up for grabs to those who enter this year's competition. NB Speed is not everything in this contest. The riders in the Tour de France will get their first taste of real climbing today as the route takes them into the Pyrenees. Today's stage ends at La Pierre Saint Martin following a climb of 1,134m in just 15.3kms. The average gradient is 7.4% but there are sections much steeper than that. The longest climb for the riders will be the Col de Croix de Fer where they face 22.4 kilometres of uphill at an average of 6.9% gradient. The steepest will once again be Alpe d'Huez with an average 8.1% gradient over 13.8 kms. Whether you watch for the racing or the spectacular scenery, the Tour de France makes for compelling viewing. PS Spanish hopes are on Alberto Contador who won the Giro this year, ours are on Chris Froome who is the current tour leader. Between 1988 and 2012, Valencia was massaging the statistics of its deficit by failing to register the expenditure on health. In 2014 the EU opened an investigation into the matter to decide whether this was a case of deliberate deception or simply gross negligence. The practice of "hiding bills in the drawer" was something not uncommon in local authorities and in fact Orihuela has been accused of doing just that. The conclusion of the investigation into Valencia though has consequences because Spain will be fined 18.93 million euros by the EU. The amount of the fine would have been much higher if Spain had not cooperated fully with the investigation. Valencia hopes that Spain will take responsibility for the payment of the fine. Since the EU did not have the power to impose fines in this way before 2012, the years from 1988 and 2011 were not investigated. The present council in Valencia says this practice no longer exists in the region and that they can pinpoint the councillors who were responsible for the malpractice. Just to let those of you who are thinking of entering for the crazy car competition this year know. 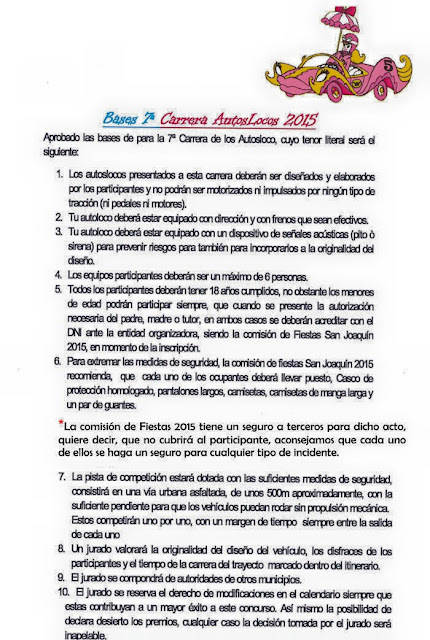 These are the conditions set out by the Fiesta Commission. Let us hope that there still a few of the cars from previous competitions left in good shape to take part along with some new ones. After receiving very little response to my posts about the Gastronomic Day which I naturally took to mean that there was little or no interest in the event, yesterday I found a note in my buzon. The note was from one of our neighbours drumming up support for a British Buffet table. In my original posts, I made it clear that I was simply sounding out interest so that the information could be passed on to the Fiesta Commission. I had and have no interest in organising a contribution from the British people to the Gastronomic Day. That is a job for someone else. That leaves me puzzled as to why those people, who are seemingly now prepared to participate, did not come forward and let me know at the time. I think it is only fair to point out that, without the information that I supplied, nobody would have known that there was a Gastronomic Day planned for this year. 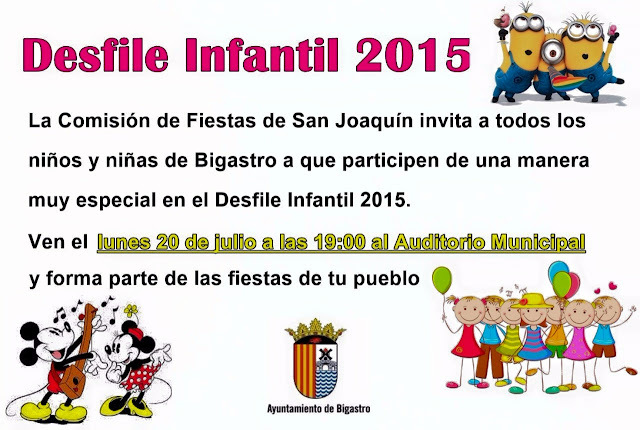 After all, it was three years ago that such an event last appeared on the Fiesta Calendar. It is a disappointment to me that we British seem unable to communicate together towards a common goal. Quite what our Spanish neighbours make of us is hard to say. Those of you who follow my Flickr account and this blog will recall that last year I was asked by the parents of the new Junior Queen to take photos of their daughter. 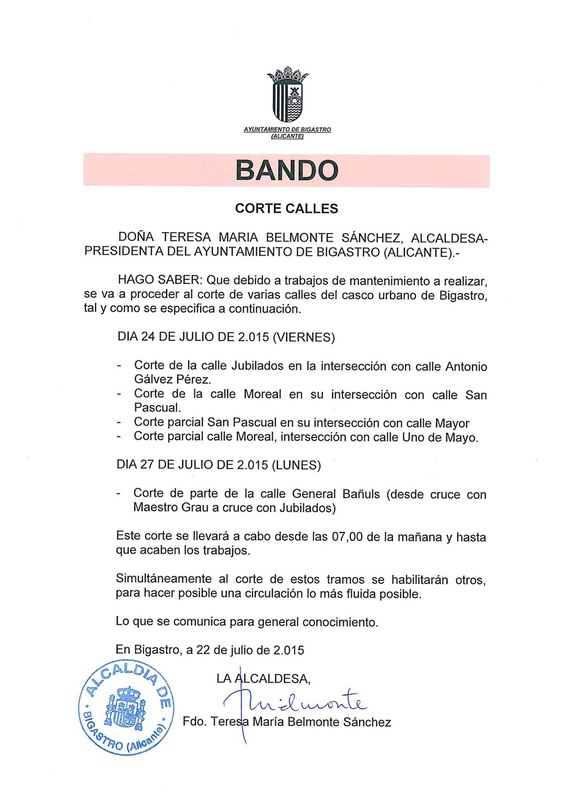 Since then, Patricia has taken part in several events including the Romeria for San Isidro. 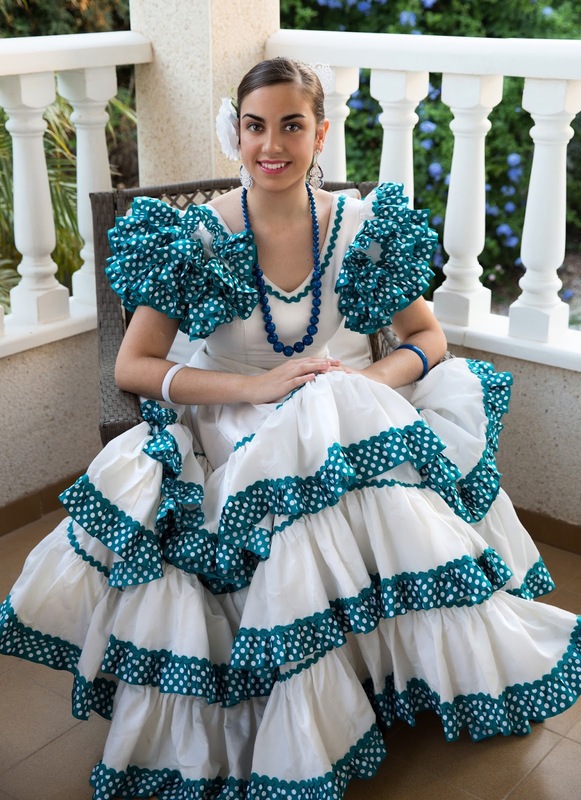 Of course, Pam and I were not here for San Isidro and so they have very few photos of their daughter from that event. They therefore came to our house to to ask if I could take pictures for them which I was more than pleased to do. This is one of the set of nine photos that I have selected for them. It shows Patricia in her Sevillana dress on our porch. PS For the benefit of Carol Thorpe, who is keenly interested in my posts about photography, I simulated a cross lighting effect by having Patricia's father stand to the left with a reflector to bring sunlight from the right to the opposite side of the face. I had a couple of flashguns ready, one firing through a soft box and the other with a Gary Fong Lightsphere in case the light became too low. As it turned out though, I didn't need to use them. 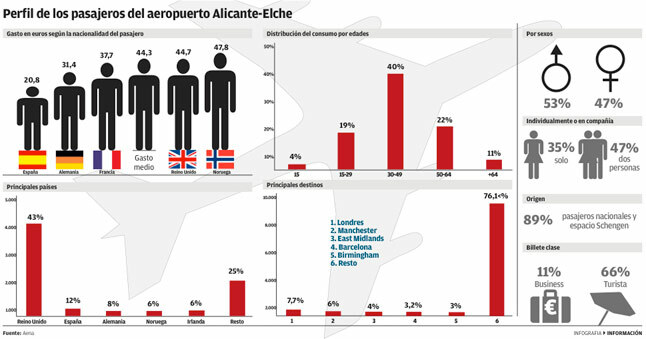 Spending at Alicante-Elche airport nets 50 million euros a year for the 20 shops and the 19 catering outlets. The airport averages 46,686 passengers a day and that number is rising. The highest spenders are those from the Nordic countries who average 47.8 euros. The profiles of spenders are interesting; 43% were British who spent the second largest amount. That figure is born out by the destinations that people were travelling to with almost 24% heading for British airports. 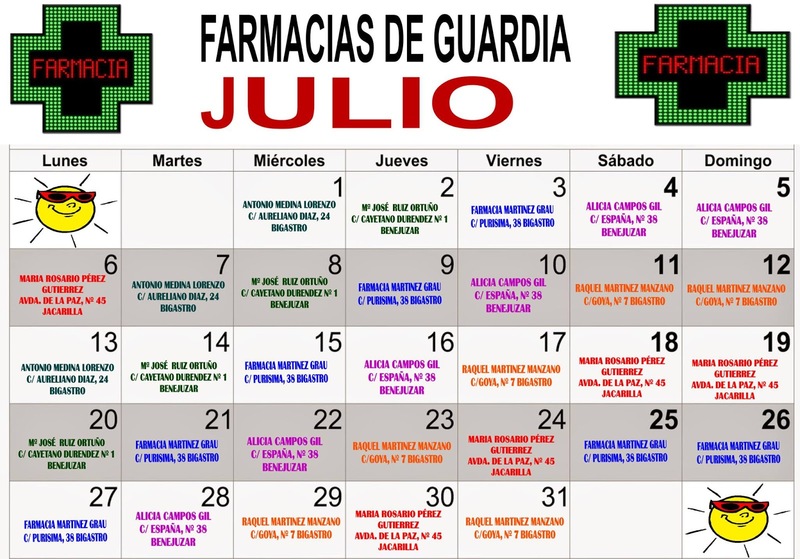 In case you were wondering where you could find a chemist open outside normal hours, here is the list for July courtesy of the Town Hall. We were warned of high temperatures yesterday. The morning was pleasant but then as we approached midday it was getting hotter. Stepping outside was like going into an oven, even in the shade you could feel the air burning you. 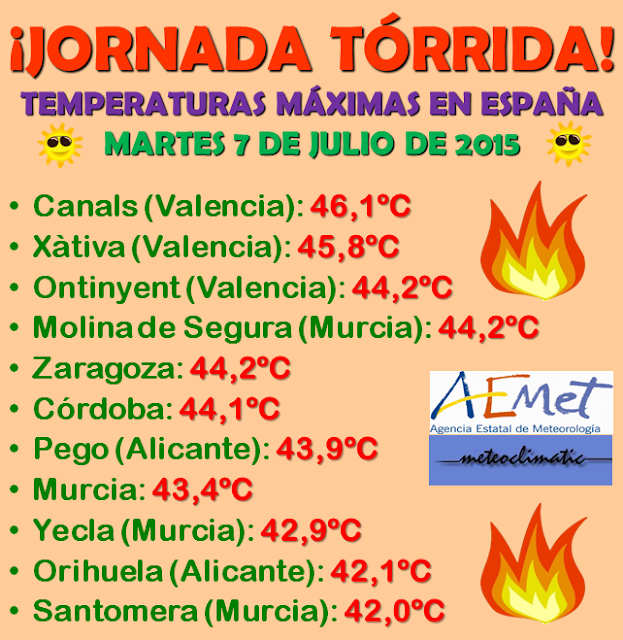 The peak came just after 3pm when an incredible 42.1 degrees was recorded in Orihuela. Just look at the temperatures recorded in other parts of the country though and you can see we were not alone. The good news is that it will cool down today and continue to cool over the next few days - 32/33 is still hot but bearable. PS If you want cooler temperatures, head to the coast where it will be a good few degrees lower than inland. This is the new list of councillors in Bigastro from the ruling PP and their responsibilities. 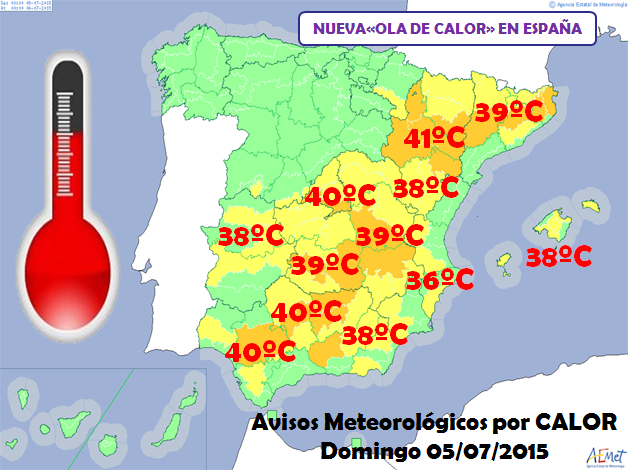 The last heat wave brought high temperatures to much of Spain. The interior was where the effect was most prominent. Starting last Sunday, we are once again in the grip of a mass of hot air coming from North Africa which will likely last for a week. AEMET predict that temperatures will be at their most intense today into tomorrow. From then things should start to cool down. First off, the crisis in Greece has seen the Euro fall against the pound. At one point the exchange rate was 1.43 euros to the pound meaning that visitors had more to spend and those of us who receive pensions from Britain got a little more in our Spanish accounts. Compare that with the 1.14 euros to the pound we were getting at one point and you can understand why many Brits are smiling. 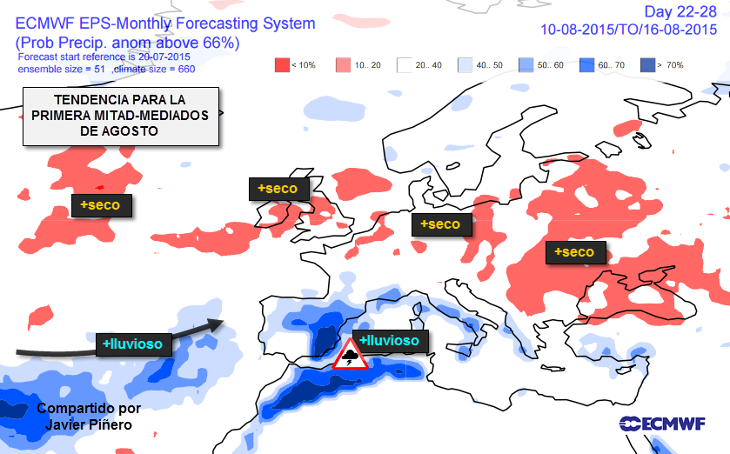 Prices of houses on the Costa Blanca have at last seen an upturn albeit just 0.69%. The average price of homes now stands at 1,457.90 euros per square metre. 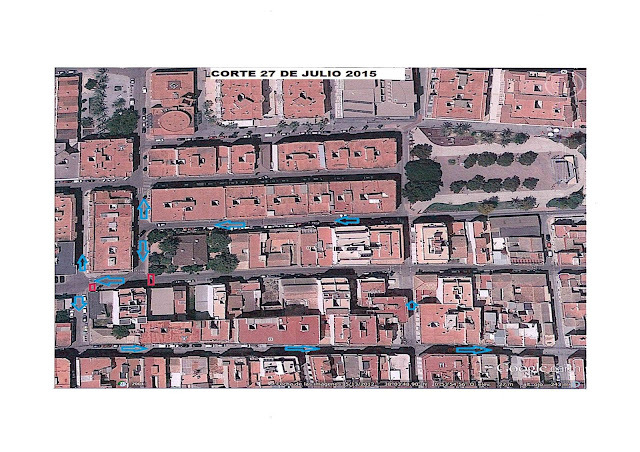 Variations exist between homes that are less than five years old and older properties and there are flats still available for 20,000 euros. At current prices, which are still 30% down on those of 2007, investment in property in Spain is a gamble worth taking. From the rock bottom position, prices can only rise as the excess stock of houses is reduced. Their no vote will bring a lot of uncertainty and may end up with Greece leaving the Eurozone but at last, a Mediterranean country has stood up to Brussels and more to the point, Germany and said enough is enough. Enforced austerity has been shown to be ineffective so why do the Germans in particular keep turning the thumbscrews on countries like Greece? OK, the Greeks have probably the worst record of managing an economy out of all of the European countries and their Finance Minister (who has now resigned) did them no favours during negotiations but in the end, the Greek people are the ones who have suffered and continue to suffer. The problem now for European leaders is how to deal with this. Do they back down and lose face or do they grin and bear it knowing that the result could be a Greek exit and may even topple the whole Euro project. That is the last thing that Angela Merkel wants - the ball is in her court. One of our Spanish friends, Eloy, came up to our house yesterday to collect the disc of photos I'd prepared from their Silver Wedding Anniversary. 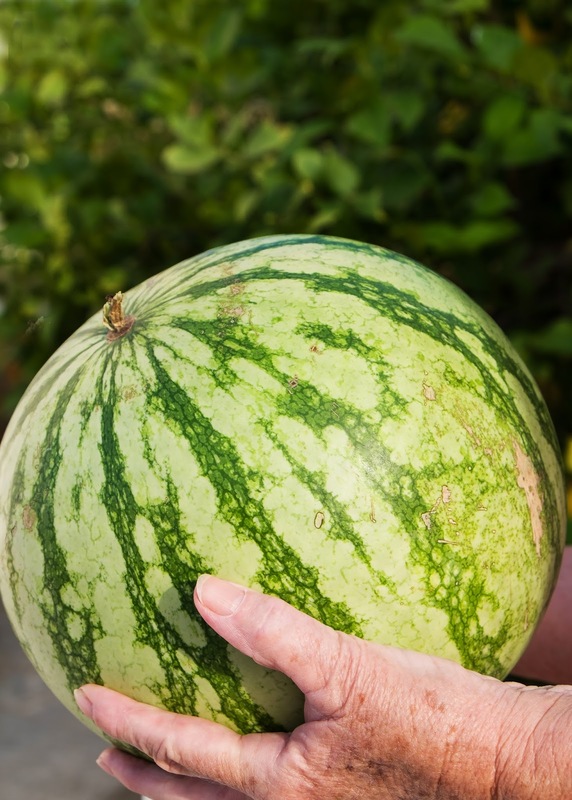 Eloy didn't come empty handed though, he brought us a watermelon which will be very welcome during this heat wave. It is true that the sight of a young lady at the side of the road can be very distracting to hot blooded male drivers especially if she is scantily dressed. I found this posted by my friend "FontaBigastro" on Facebook. 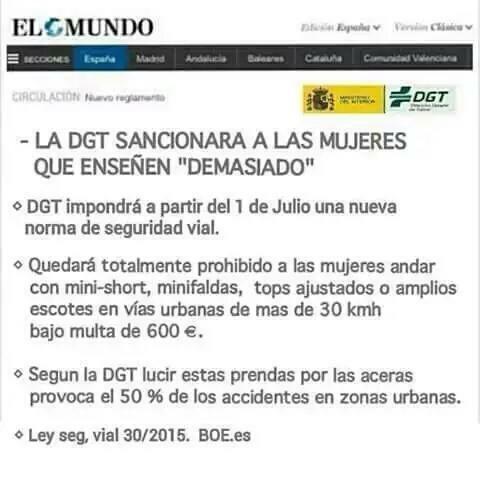 The DGT (Dirección General de Tráfico) claim that this type of distraction causes 50% of the accidents in urban areas. In order to save us weak and unfortunate males, a new law has been passed prohibiting ladies wearing tiny shorts, mini skirts, tight tops or wide necklines from walking alongside urban road where the speed limit is more that 30 kilometres per hour. Those that do face a fine of 600 euros. Thankfully, the National Police say that this notice is a FAKE. That means that young girls can continue taunting we men in summer with their provocative dress. 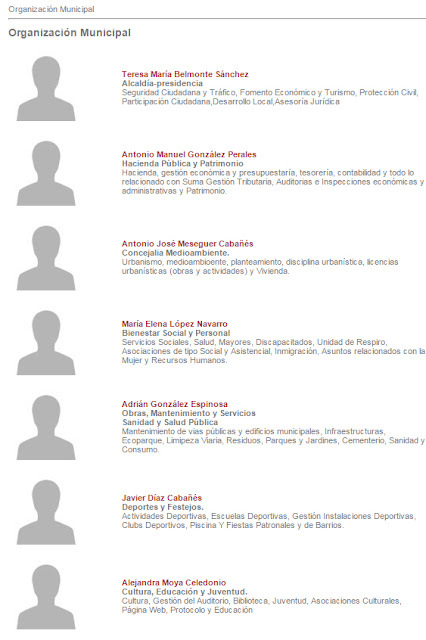 The five parties that formed the council in Torrevieja (Los Verdes, PSPV-PSOE, APTCe, Sueña Torrevieja and IU) proposed that full time councillors should receive 3,200 euros per month, 3,000 for the other members of the group and 2,900 euros per month for the opposition parties. 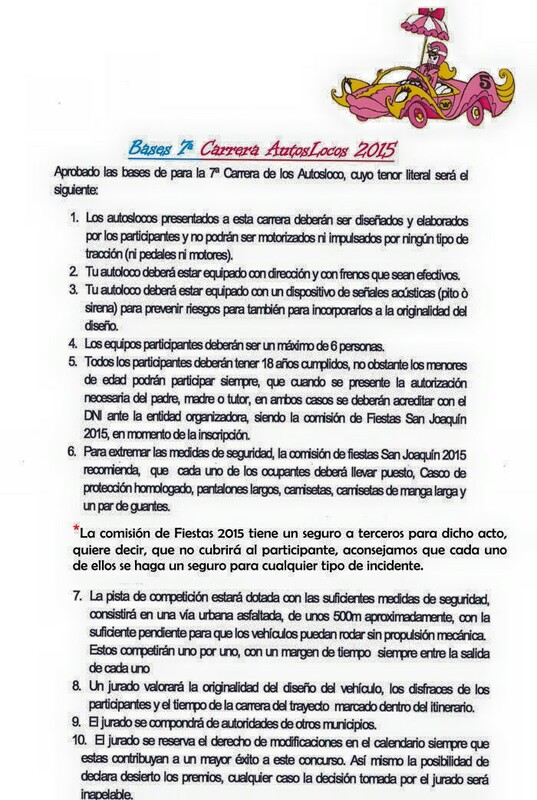 The PP and Cuidanos have rejected the proposal saying that the total amounts to 632,800 euros. They claim that their proposal shaves 46,270 euros from the bill for salaries. The net outcome is that, as things stand, none of the councillors will receive remuneration for their work. Maybe that was not such a clever move on the part of the two opposition parties. 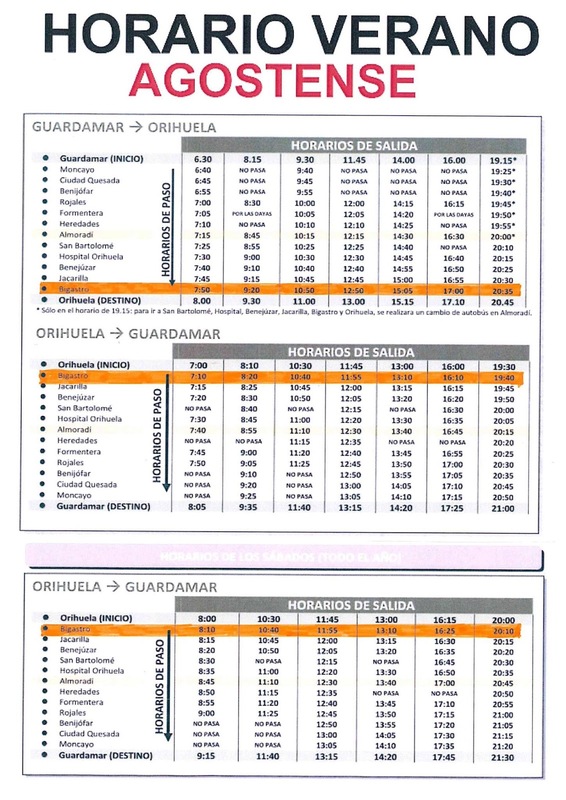 If we thought that the financial situation in Bigastro was bad, consider the case of Orihuela. 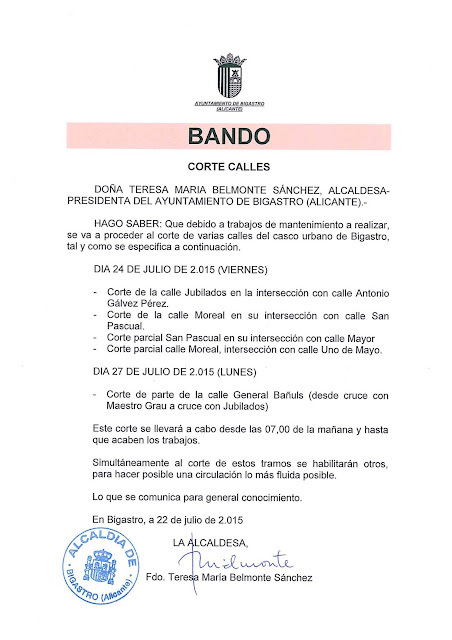 The new PP mayor, Emilio Bascuñana claims that the council debt for Orihuela stands at 63 million euros of which 42 million is financial debt. He says that there is no money for salaries nor for advisers and he puts the blame for this on the previous council that was run by the PSOE and the Greens who who says were reckless in the way they ran things. Britain is on alert today for high temperatures. Forecasters say that it could reach 35 degrees in the south of the country and warn the young and elderly to stay indoors during the hottest part of the day. There is also a danger that rail lines will buckle under the heat causing disruption to rail services. It seems that some newspapers in Britain like to cause panic whatever the weather, heavy rain, high winds and now hot sun. A reminder from the Ayuntamiento to dog owners of their responsibilities. First off, the responsibility of owners to collect the excrement their dogs leave in public places. 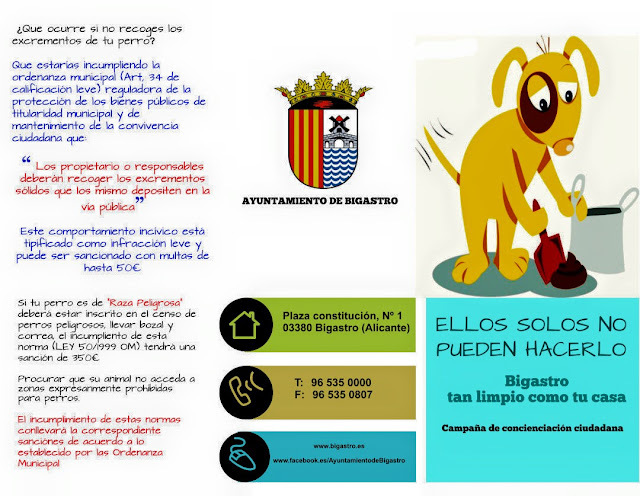 There is a fine of 50 euros for those who fail to pick up the crap their dogs leave on pavements but as we know that requires a police officer to be on hand at the time. It is a social responsibility though and one which all dog owners should take note of. 2. Dogs that are regarded as dangerous must be muzzled whilst out in public. 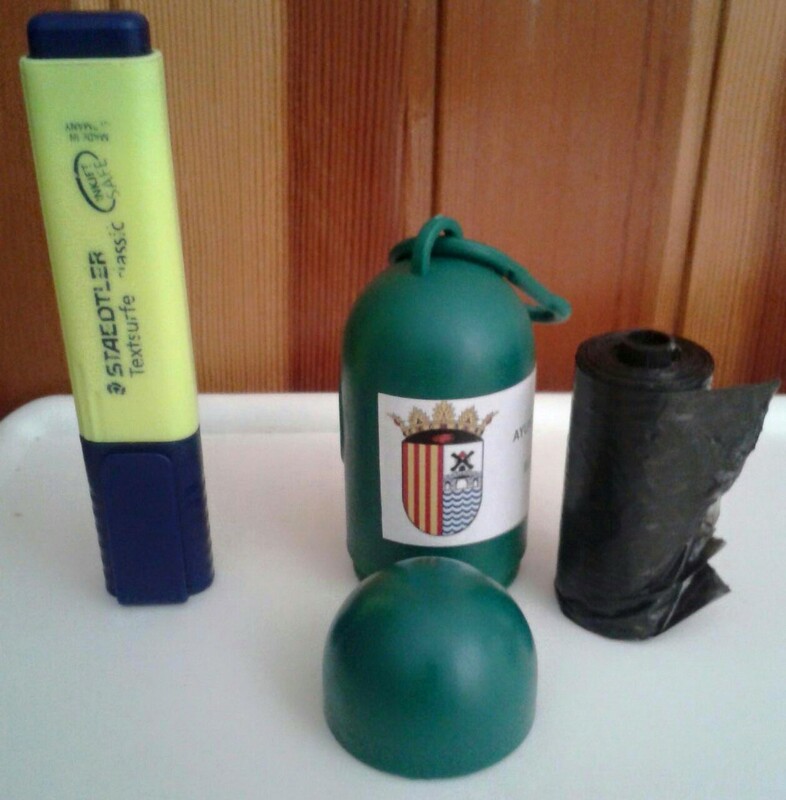 The fine for failing to observe this is 350 euros. It is far better to muzzle your dog than face the consequences of someone being bitten. Lastly, do not take dogs into areas that are meant to be dog free. Those who took their dogs to be vaccinated will be getting a handy container to carry their plastic bags in.